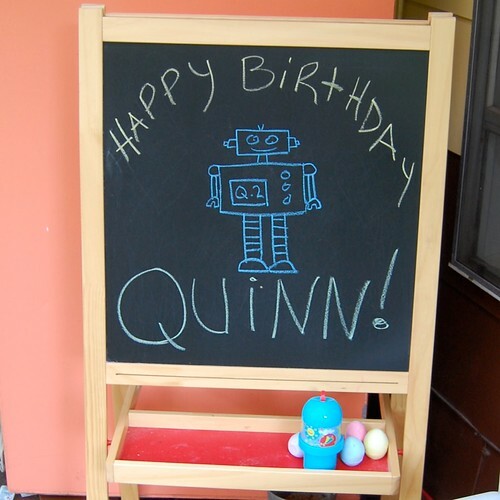 Recently we were invited to a robot themed birthday party for a 2 year old named Quinn. Never one to let a good theme pass me by, I decided to wrap my gift accordingly. 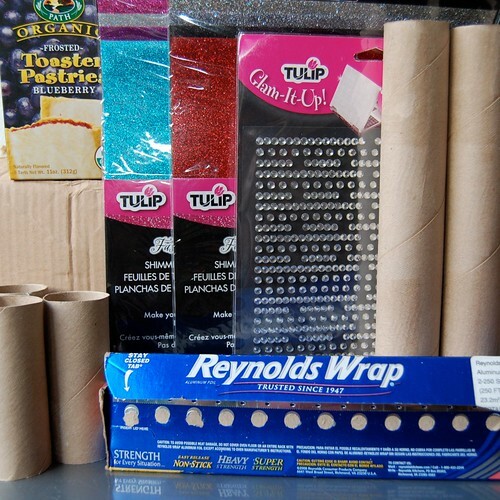 Save up your old boxes, cans and toilet paper rolls and you can make your own. First you want to get all your robot parts ready for assembly. I wrapped the arms, body, legs and neck in tin foil. You can use tape or glue to fasten it. Be sure to put your gift inside the large box before you wrap it in foil. 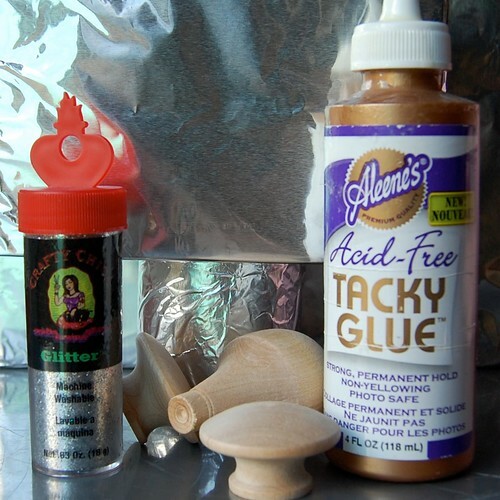 I also got my wooden knobs ready by covering them in Tacky Glue and sprinkling with Crafty Chica glitter while the glue was wet. You can find these random sized knobs in the wood aisle at your craft store. Allow them to dry completely. 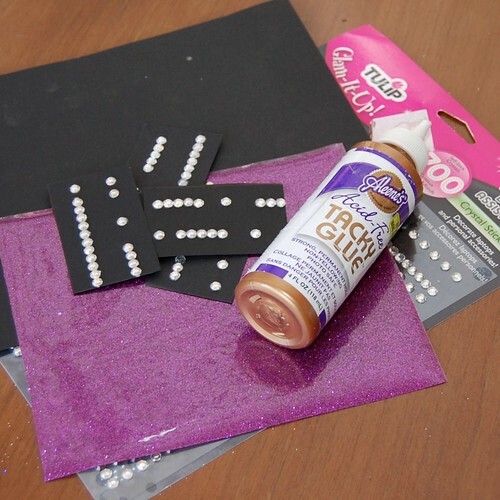 Using black construction paper, Tulip Glam it Up Crystals (which are already sticky backed) and Tulip Fashion Glitter Shimmer Sheets decorate your robot body. I cut out one large piece of purple glitter, several small black paper rectangles and then attached to my body and adorned with crystals. Making the face is the same as the body. The design you choose is totally up to you. 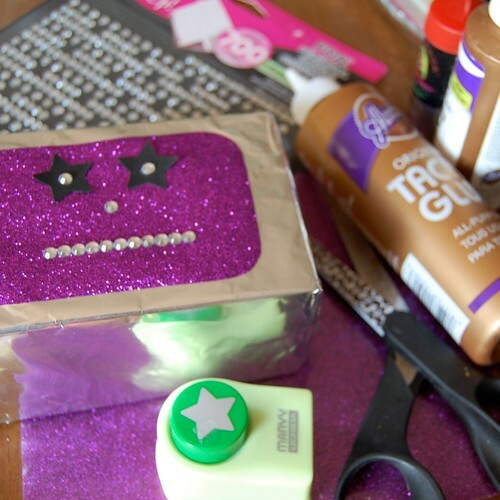 Once you have your face on the box using Tacky Glue add your glittered wooden knobs. I added one to each side of my robots head and one on top for good measure. All that was left to do was glue everything in place. I used a hot glue gun/tacky glue combo. The hot glue allowed everything like arms and tin can legs to adhere quickly. Once the glue cooled I went over it with Tacky Glue to make sure it would all stay in place. Our wrapped up robot fit right in with all the other bots about. Tune in next week for Robot Party Part2. 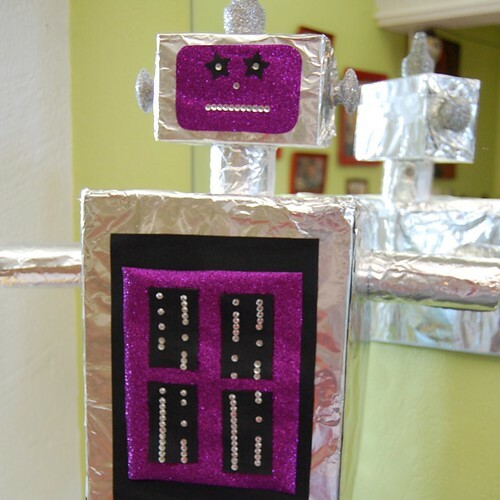 Also want to make more recycled robots? Check out this project. Looking for more wrapping paper options? How about a wrapped lamp shade, cassette tape gift bow, customized ice cream carton, wrapagami, gift wrap trends, vintage wrapping paper and wrapped gift hula hoop wreath. 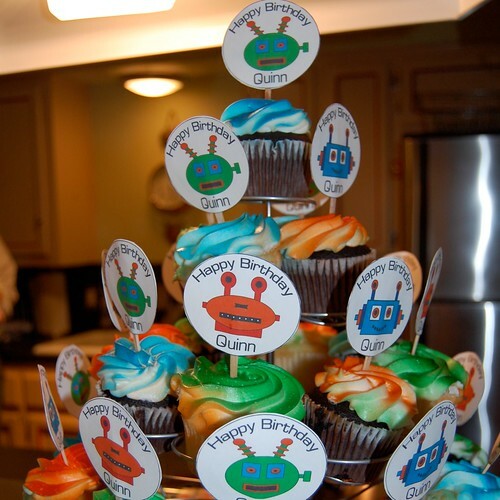 Posted June 30, 2011 & filed under Crafty, Eco Craft, I Love to Create, Kids, Paper Crafts, Parties. OMG this is sooo cute! 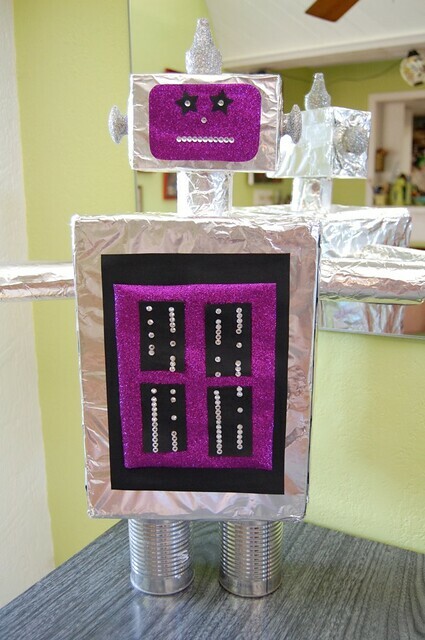 Reminds me of the robot costumes we made for the kids on Halloween a few years ago. We added some glow sticks and car reflectors that would work on these packages too! This kind of creativity is always more fun than just plain old wrapping paper. Thanks for the inspiration! 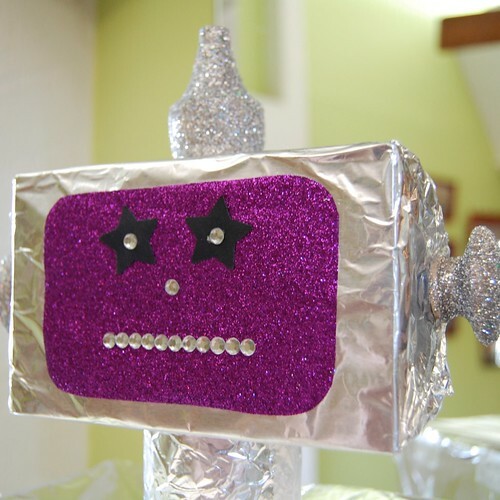 I love your robot wrapping!! I know a 42 year old that would love a present like that!